Green and cream tones with simple vines and swallow murals on the wood log walls. A sleigh bed on the corner with thick pillows continuing the green and cream tones with its sheets. A comfortable, light green love seat at the foot of the bed and in front of it, a Chippendale tea table with dandelion flowers in a vase on top of it. A three-tone room of grey slash brown, cream and flirty orange with wood grain walls. A divan bed with a hard wood headboard next to a wide window with grey and cream sheets. On it a mix of pillows of cream and orange colors. Next to the bed, just before the window, a hard wood side table with simple designs. On top of it, an orange lamp, an old fashioned alarm clock and a bottle of yellow poppies. A room that is predominantly wood. Wood log walls, a wood chandelier to highlight the high ceiling, wood side tables, two that are simply carved and a heavy, wooden four poster bed. Heavy, cream window curtains to disallow light. On the bed, coffee-colored sheets and blankets and a mix of pillows the color of coffee and cream. On the floor is an intricately designed aubusson rug. Lamps on the side tables and an overhead light provides illumination in the darkness. A whitewashed room that the only color present is the individual ebony foot stools at the end of the bed, the coal shag rug and the wood grain floor. At the corner is a half tester bed with white sheets and a mix of white and cream pillows. On the white side table is a white lamp. To cover the window slash balcony door, a heavy, white curtains present. A room that is predominantly both wood and stone with wood walls and ceilings but with a stone fireplace and floors. Wide windows, sporting each a window couch and heavy, dark drapes. A wooden Ceiling Fan for Hot Nights. On the half tester bed and the window couches, sheets of very light blue and green hues with a mix of pillows on the bed on the window couches. Pillow cases of the pillows the color of light blue, green and pink or red. 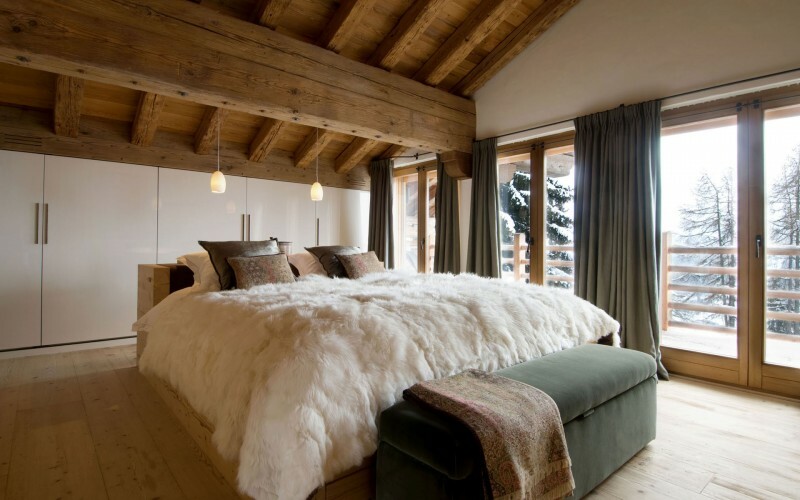 A cozy room of wood walls and wide windows. On the corner is a half tester bed with a cushioned but heavy headboard. A mix of pillows and regular and fur sheets on it. Each side of the bed is decorated with side tables with mirrors. Lamps on them. Decorating the ceiling is a chandelier that can be considered a metal sculpture. A simple room that is mostly wood from the floor, to the walls, to the beams on the ceiling. A wide window shows the patio that is, in itself, another room with no ceiling but walls and a window at an angle showing the scene outside. A single couch and a black and white art work was next to it. 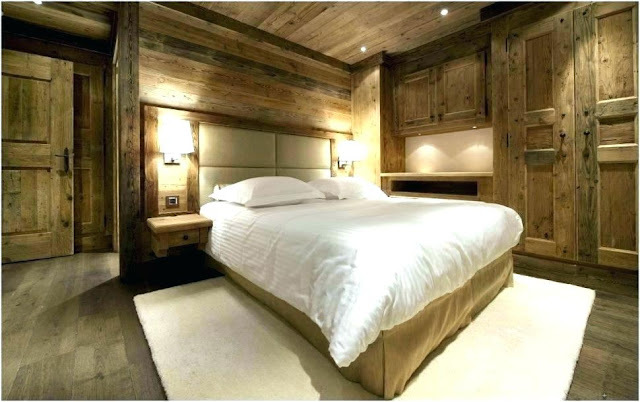 The platform bed on the corner is made of thick wooden planks designed to be pleasing to the eye. On it, a thick duvet and pillows. Beside it was a simple table with a lamp. How about a bunk bed built into the wall? The bunk itself is made from wooden planks while the ladder and the bunk corners of both the upper and lower bunk were made from tree branches that lent an almost surreal feel to it. Next to it was a window with a window couch and on the ceiling is a dark glass chandelier that is of a metal design. A room that is primarily black. From the black window shade to the black walls to the wooden ceiling treated to look darker than its wood color. The divan bed with a black headboard is the center piece of the room. on it, black and white pillows and a fur sheet on top of regular sheets. On the wall, above the headboard, are mounted antlers. The large lamp on the bedside table illuminates the area. A stainless steel fireplace in the middle of the room! Right beside half tester bed with sheets and fluffy pillows you could just jump into. On the other side of the fireplace, wood to fuel the fire. Big windows to brighten the homey room are also present. A chair and fur rug on the corner to relax in.